Additionally, Miller Dial LLC can provide complete engineering services, including rigid and flexible printed circuits, plastic injection molding and software development, for Turnkey Assemblies. The product line has been expanded to include locks and shielded polycarbonate windows. Since its founding in 1937, Miller Dial LLC has established a reputation for quality solutions and a focus on customer satisfaction. Miller Dial has managed printed circuit board integration with a wide variety of our customer’s applications, including back plates with studs and standoffs. Miller Dial can provide complete turnkey control panel assemblies for all membrane switch applications. Innovative key coatings for our silicone rubber keypads are silicone, parylene, and Dura (Hard Coat). An additional level of control for user interface elements can be attained through the use of rocker switches. Silicone rubber keypads can be designed for applications exposed to water and hydrocarbons. Enhanced graphics and lighting options allow your product to incorporate features not found on standard silicone rubber keypads. Miller Dial LLC has often provided management of the printed circuit board integration and manufacturing for its customers. Complete turnkey assembly is a commonly fulfilled request. Miller Dial began manufacturing metal nameplates in 1937. The metal nameplate manufacturing facility, which includes complete metalworking and fabrication capabilities, ensures rapid turn-a-round while maintaining quality assurance procedures. Complete steel ruled die and Class A hard tools are produced in house. Alternate applications include hot stamping, serializing, anodizing, etching, and embossing. Represent your product with brand identification permanently imprinted on metal. Consumers naturally associate quality with an attractive representation of brand labeling. Unique ideas and applications are available. Contact one of our innovative sales technicians to discover the latest trends in brand identification. Miller Dial produces domed labels by encapsulating graphics in a clear polyurethane dome. Domed labels are soft to the touch, recover if indented and are suitable for interior or exterior applications. Manufacturing is done on a wide range of substrates that adhere to many surfaces. Label finishes include: High Gloss, Holographic Effects, Brushed Chromes/Golds, and Half-tone printing. 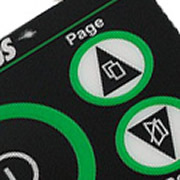 Graphic Overlays comprise the top layer of a typical membrane switch application and can be made from an extensive line of polycarbonate, polyester, and acrylic materials. Features that are available include: color matched solutions per customer specifications, finishes and textures that meet customer requirements and durable solutions that provide excellent weathering and superior tactile feedback. At every stage in the manufacturing process, our Quality Team provides guidance on process improvement. This collaborative work process yields excellent results for both low and high volume production projects. With technical sales representatives covering all of North America, our customers are assured of support in every aspect of your interaction with our team. In order to ensure quality and on time delivery, all phases of the Miller Dial plastic injection molding manufacturing operations are monitored and controlled by adherence to extensive ISO quality procedures. Through its experience and expertise, Miller Dial can provide the following services: product assistance after design, engineering support, life cycle and environmental testing, specification writing and preparation of unique manufacturing procedures for each product. Miller Dial provides a complete range of optical filters. These optical filters have an embedded metal mesh providing a significant depreciation of the effect of electromagnetic fields. Our filters can be produced in a wide variety of colors. We always have a filter appropriate for the wavelength in your display. Miller Dial’s EMI shielded windows achieve optimal light transmission. Secondary light is filtered out, obtaining the clearest, readable interface.